If you, like so many millions around the world, love tennis, know a thing or two about it, and would like to share this knowledge or information to visitors of this website, send it to me, and I will promptly publish it. Include your name and a brief description of your self. Get a chance to be a part of this community of tennis enthusiasts. A tennis article will enhance your credibility as a tennis coach, get that journalistic itch out if you are an author or an aspiring one, or simply get yourself noticed by the online community of tennis lovers. Just send the tennis article now and get published. Thanks. Max Gregor is a SEC tennis player that teaches How to play tennis and then maximize on your game with equipment reviews, tactics, drills and more. How is it that players that are barely heard of in singles are dominating the doubles scene? The Bryan brothers, especially Mike Bryan, never broke under 200 in the world in singles ranking, mostly hovering round the 400 to 500 hundreds. However, in doubles they have figured out the key to how to play tennis and successfully won over 65 ATP tournaments. It is nothing magical, tennis doubles is completely different from singles and therefore requires a separate mindset, tactics, and drills. So what are some of these factors that help players reach greatness in doubles? 1) To successfully win in doubles you need energy. It is contagious, and spills over to your partner, making you both more alert and more ready to do some damage! Furthermore, it intimidates the opponents. Nobody likes playing those guys that just look like their having the "best day of their lives", most opponents will automatically take the roll of "playing bad" or a "having a terrible day". 2) Be offensive. Of course, you have to be ready to attack before you go out into a doubles match. In doubles it will be very difficult to win while being defensive or sitting back behind the baseline and rolling balls in. It gives your opponents too much time. So make sure to be committed to stepping into the court and taking those second serves on the rise! 3) No negativity. Most players don't even realize they are doing it, but being negative is something that your opponents pick up on quickly through body language as well as through hearing. Unfortunately, in doubles it puts pressure on your partner as well as giving the opponent a morale boost. Your partner will suddenly feel he is having to "carry you" through the match and this is a sure way to get you both out of the "zone"
4) Have confidence. Confidence is not something that can be gained by a mind trick. The best way to gain true confidence is to be completely ready for your game, you need to come out on the court knowing you have practiced your strengths and weaknesses and that your are feeling at the peak of your form and ready to go! This is the best source of confidence, and that is why you should try feel like you have done everything you can, in the time you have, to play your best tennis. 5) Doubles Tactics. Like in singles, you got to use your weapons in doubles. By that, I mean finding how to play tennis way with your strengths, preferable to their weaknesses. However, this is not something that you should be trying to figure out in the 10 minute warm-up. The best doubles teams have been playing together for years and know exactly how it is most beneficial for them to play on pressurized points. It takes some pre planning with your partner, but taking the time to set up your plays and even analyze your rivals before the match... will benefit you greatly in the match, especially under pressure. Points in doubles are naturally short, and it is hardly surprising when there is one person all ready waiting at the net ready to put away any shot that floats his or her way! Nevertheless, the first three shots that appear consistently in doubles are the first volley, serve and return. 7) Controlling Fustration. As mentioned previously controlling your emotions in doubles is just as important as doing it in singles, if not more important. Everything you do on the court will impact your partner, so it is vital to make that impact a positive and energetic one. If you find yourself getting angry, impatient, or frustrated you will need to convert that energy into a positive energy... many players do this by focusing on the breathing in between points, or following a ritual such as straightening out their strings. This helps keep your mind on the important elements of how to play tennis such as the game and tactics rather than things that can't be controlled such as lucky net cords. As a sports mindset and mental motivation skills coach, a tennis team has coaches and players who come together to form a team. Before the season and during the season the players, coaches, management, and fans find solutions to common challenges, uncommon challenges, and problems to be empowered with a plan of action. It’s critical each player feels a part of the process and is allowed to express their thoughts. The goal for the coach is to first understand and relate through introspection what their thoughts are and the mindset needed to perform. Then, each players dream, goals, and skillset must be taken into consideration and related to prior to the start of the season and adjustments made as we face competition. This allows me to choose the appropriate structure for the session to grow the players and team. It is critical after the housekeeping (introduction, tell participants the length of the session, break time) to get everyone’s buy in we must work as a team to go to another New Best Level. My research indicates in any organization people want to be on a team. Why? Because they love being involved, the interaction, and seeing each other succeed. Of course, this means the team wins. Therefore, consider using the Winning Mental Pyramid mindset tool. It is leading edge research that I apply when working with sports teams, businesses, and mental health organizations. The Winning Mental Pyramid is a mindset tool you can file in your mind and retrieve for introspection and introspection of each player prior and during the season. Learn it to grow and evolve your coaching skills. Motivation has a relationship with inspiration and your motivation controls your attitude. This is the top line or why? Your attitude controls your mindset. It’s important to have a positive attitude. Your mindset controls your mood. Mindset is the way we think or what we think. Your mood has a relationship with subconscious. This is the bottom line or action. It’s what causes us to do what we do. How it works is easy. Applying it takes focused effort, practice, and patience. As you become more skilled at using it, your team and leadership teamwork will be less doubtful and the mood will flourish. When the Winning Mental Pyramid is aligned there is a tremendous amount of synergy for peak performance. In most cases, it’s not aligned. Recognize where is the misalignment and focus on this area. Keep in mind the relationship between the four areas. In many organizations I see a coach or athlete make a comment about a players attitude problem. They focus on addressing the persons attitude. Instead, since motivation controls attitude, the area that needs to be focused on is the players motivation. Tennis teams should want to make a positive difference (motivation), win championships to make money (mood). If they are not winning championships, then it’s their mindset that needs to be focused on. If there is resistance to positive change, then it’s their attitude that needs to be focused on. Try it for yourself on any tennis team you succeeded with or failure to know what was or could have been done. Then do it with a new team. Did it work? What are your results? Are you winning? Will you abandon it or use it again and again to learn from it, grow, and evolve to produce better moods and results. Isn’t that really the bottom line (a better life)? Create momentum to win championships. Raj works with tennis teams that want more productivity by improving their mindset, mood, and motivation to win. He is the author of Winning at Entrepreneurship. Contact him at 404.918.7366, raj@rajgavurla.com or visit www.rajgavurla.com for more information. Alex Claussen have been a competitive tournament player since the age of 9, and over the past several years have written many tennis-related articles. You and your opponent just walked out on the court. You warm-up, and the match starts. You start off the match with an error in the net, and a “C’mon, right here,” rings in your ears. You let it go. Next point, your opponent says loudly the same phrase just as you begin your ball toss. You double-fault. It is one thing if your opponent is trying to pump himself up, but I don’t think this is the case. During the many years of my playing of tennis, I have encountered players whose strategies heavily rely on this concept, gamesmanship (and cheating too). And of all the cases I have encountered, it wasn’t the actual acts of gamesmanship that won the match, but the overreaction of the victim player. If you are an active player, you’ve probably experienced players like this many times. Whether it’s stalling, questioning every line call, or like the example presented above, we all need to learn how to handle gamesmanship that leads to on-court meltdowns and ultimately the match. The trick is to tame your own game and not get caught up in your opponent’s behavior. If your game begins to weaken because of gamesmanship or cheating, try these strategies that will help you win more matches against players who don’t deserve them. When you begin to feel frustrated, you have to forget the points of the past and regain your concentration. Take your time before points, and image the point that you are about to play. Breathing before and after points will prevent you from rushing and you may even irritate your opponent. While playing the point, just focus on the ball and don’t let anything distract you. If you can get more balls in play, you will have time to build your momentum before hitting a winning shot -- or wait for the error that your opponent will make. More than likely, if you are frustrated with your opponent, you will feel rushed and try to go for an amazing winner. Just wait a little bit longer and you will see results. If you know your opponent is cheating, don’t ask, “Are you sure?” When cheaters cheat, they choose to call balls out that are so close to the line that they can get away with it. And if you did call a good ball out, would you like to face the crowd and admit your lie? I don’t think so. Maybe ask it once or twice to make sure they know that you know they are cheating, but don’t embarrass yourself. Instead, ask an umpire to watch the match. Your opponent will then know you are serious. 4. Know it Goes Both Ways. Even though I wrote this article because as a junior, I was so frustrated with all the little cheaters out there, I have probably given my share of bad calls. You don’t have to argue about every single close ball. You may be wrong, but don’t sit there without action. And don’t be a jerk about it either, because it will just make it worse. Tell your opponent directly, or try the methods I have listed above, and you will see fewer losses to cheaters and players you have worked hard to beat. Tomaz Mencinger is a tennis coach and mental toughness coach. He teaches tennis players how to apply tennis psychology to make their mind their best ally. Being a master in tennis psychology is usually a deciding factor for winning tournaments regardless of level that you play. Mental toughness is important whether you play at a local club tournament or Wimbledon final you need to handle all the pressure from playing a big match. The psychology of tennis is based on sports and general psychology and applied to tennis specifically. What you learn are not just tips and general advice but much more effective methods of controlling your mind and state that you are in. Many players have good concentration in the beginning of the match but then their level of focus starts to go up and down. The reasons can be outside events, pressure situations, emotional outbursts or just fatigue. You'll need to learn how to deal with these situations and keep your concentration high even when these events happen. Arousal means at the same time your emotions and your body energy. If your arousal activation is too high, you are angry and you have too much energy (thats why players throw racquets to release energy). And if your arousal is too low, you are frustrated and have low level of energy. Both states prevent high level of tennis play. Learning to find the ideal state is the key in controlling your arousal and one of the most important aspects of tennis psychology. There are many things that you cannot control: wind, court conditions, opponents play, bad line calls and so on. If you put too much attention on these events, you get irritated or even upset. And yet the events dont change only your level of play drops dramatically. Negative thinking affects your body abilities creating tension and it evokes negative feelings emotions that cloud your judgment. If you are aware of your thinking you can change it to positive and solution based thinking. That is the mark of the great tennis players. Being aware of your thoughts is quite a challenge in the psychological approach to tennis. Imagery or visualization is extremely useful in all aspects of the tennis game. You can improve technique, strategy, physical abilities and mental preparation of certain events. Another use of imagery is when you miss a shot and then see in your mind how you hit the ball correctly. Using visualization is an incredibly efficient technique, not only in the psychology of tennis but in everyday life too. Confidence is one of those elements where tennis psychology can help quickly and with very simple tools. If you are not confident you will hesitate, you'll be afraid to take risks and your shots will usually miss by just a little. When you build confidence you are able to play your best even when things dont look to go your way. Thats how you change them. These techniques and exercises form the base of tennis psychology and if you apply them regularly you will develop mental toughness. You will know how to apply the tools and how to deal with tough situations in tennis matches. You will have the edge against your competitors; you will see that that most of them have no idea of mental training and that will make you feel even more confident. You'll know that you are the likely winner of pressure situations and that is the belief of a champion tennis player. Doug Yurchey received a tennis scholarship to Edinboro State College. He is a writer, artist and inventor. For 2 years, he drew backgrounds on the Simpsons TV Show. On the Internet, he writes of mysteries and promotes various theories. Doug would be glad to hear your feedbacks. Why has tennis been demoted and decommissioned to a second-class sport? How did it fall below golf, hockey and even poker on television's priority list? What is the problem when the most beautiful game is barely mentioned on the sports shows or written about by sportswriters? Although the U.S. Open will receive a fair amount of attention, what of the next tier of events? Not that many years ago, it was possible between January and September to find the German Open, the Italian Open and even smaller tournaments on the air. Today, the game seems to be devolving into an ever-smaller niche sport. Why isn't tennis as popular as it once was? While many argue the answer is in our hands, I believe it is below our feet. New, powerful racquet have drastically changed the game. Too often, hard or grass court tennis is all serves. Light, space-age materials along with advancements in racquet technology produce nearly jet engine propulsion and almost no time for a receiver to get set and produce a competent return. From clay courts, there are complaints of endless rallies, as the racquets allow anyone reaching any ball to hit a deep topspin shot into the court. Just where is the middle ground? Audiences want to see a real variety of big serve, rallies, finesse shots and 'touch.' The new racquets encourage players to play at either one extreme or another. But the problem is not the racquets. There is nothing wrong with laser-like tennis shots. Ground strokes struck with pace are exciting. Returning high-speed bombs or sliding from one end of the court to another is an amazing art. Technological innovations cannot be forgotten. Do not take measures to slow the hard court game or end the artistry that makes clay court confrontations so fascinating. Science marches on. They will always improve the racquet, make it lighter, more accurate and more powerful. The problem is not the new, powerful racquets! Today's racquets have outgrown the standard-sized court. The court specifications date from the 19th Century while we play on it with weapons of the 21st Century. When Major Wingfield patented tennis in 1874, the ball could not be struck as hard as it can today. Only minimal pace could be forced on a dead ball because of the utter crudeness of 'rug-beater' racquets. When the court was first laid out, who would have imagined the power, speed and fitness that is modern tennis? For a few years, I've been tinkering with ROVAL as an update to the game. Since everything else seems to look less boxy as it gets modernized, why not the tennis court? Why can't it be an oval shape? Also, why give the server such a natural advantage by sending the opponent off the court retrieving an angled serve? Originally, a serve was just a way of beginning play, and while tactically we can't go all the way back to that, perhaps we can adjust the court to the evolved tactics. Thinking just of singles play, why do we need the boxes on the court? In the illustration of the ROVAL court, the dark color is IN; the light color in the center and around the court are OUT. We have returned the game to one that honors the spirit of its origination. For example, serves must clear the 'Plex' (i.e., the updated net) and strike the 'Soval' (service-oval) to begin the point. Because the Soval is a harder target than the present service-square, serves have to be spun in, reducing the number of one-shot points. Again, during the point, balls landing within the Soval are OUT. I foresee a court that is actually 4 feet longer and 4 feet wider than a singles court. But so much of the court has been removed, there is considerably less area to cover. Lets should be played and foot faults eliminated since servers are 2 feet farther away. It might sound illogical for a smaller court to produce more rallies. But, quick points will be eliminated and the 'construction' of points will become important. I understand it will take some development play to help tennis evolve, but for the game to regrow in popularity by restoring the balance between power and finesse. Perhaps some women pros could challenge the men pros on this new, finesse court? We have to start taking non-traditional steps and I propose we do it on a ROVAL court. My name is Doug Yurchey. I am a writer, former ‘Simpsons’ background artist and inventor living in Los Angeles. Enclosed magazine from 2005 is a gift. Rafa is on the cover of Tennis Week and my new design for a tennis court is near the back of the magazine. Please turn to page 94 where you can see my SINGLES COURT THAT HAS NO LINES! I have changed the playing field for a very important reason: The court is too large. Courts have become too big because of advances in racquet technology which can now send a ball over 135 MPH. Classic courts from the 19th Century were never designed for such velocities. The singles court was patented in 1874 when tennis balls traveled in SLOW MOTION compared to today. Imagine those early days; there was all the time in the world to run left or right to return shots. There was all the time in the world to move left or right and return serves. Serves did not dominate the game, but only began the point. No lines are necessary. Roval is played by serving at the very ends of the oval, which are 2 feet farther away. Lets are played and there are no foot-faults. As long as the server begins at the extreme ends, beyond the dark area, they are allowed to step into the court during forward motion. YOU MUST HIT THE INNER ‘SOVAL’ (service-oval) TO BEGIN THE POINT. You get 2 serves to strike the Soval or you double-fault. 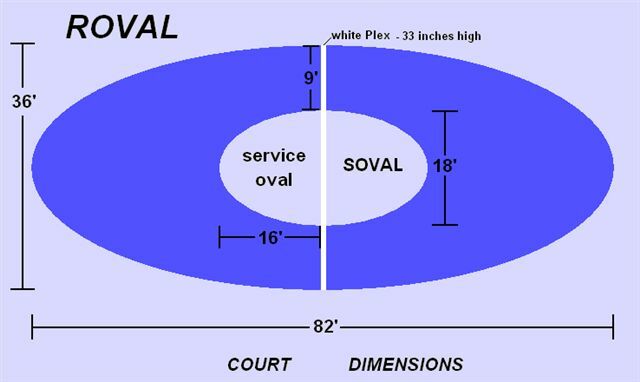 As soon as the service-oval/Soval is hit by the serve, the point begins and the center Soval becomes an OUT-area (painted the same light color as the outer area beyond the dark court). I also wrote to Queens in New York in the hopes they might like the idea and build a ROVAL court-of-the-future on the grounds of the U.S. Open and former World’s Fair of 1964. I thought a lineless court would be cool and tennis fans would probably LINE-UP to play on a new and different kind of court. I think Roval could be a very popular exhibit. Here is an approximate view looking lengthwise. The idea of a HARD NET called a ‘plex’ is because of the 6-inch swoop/curve differential in the classic net. In Roval, the court curves but the center-divider stays STRAIGHT along the top. It is rounded, smooth to the touch…but remains perfectly straight along the top of the plex (Plexiglas, no net). A safe center-divider or plex would be difficult to build. Below is only a suggestion of how the straight and also smaller divider (hard net) could be accomplished. (Plex slabs made to pop-out if run into by players). JOHN MCENROE GAVE A SHORT TALK AT THE 2007 U.S. OPEN CONCERNING THE PROBLEMS IN TENNIS; HOW YOUNG PLAYERS DO NOT COME TO THE NET OR KNOW HOW TO CONSTRUCT A POINT OR KNOW HOW TO VOLLEY ANYMORE. HE SAID: ‘MY SOLUTION…SMALLER COURTS! AN IDEA WORTH TRYING.’ McEnroe spoke of a whole generation, basically and tragically, influenced by the modern game or power racquets. For years, he has been saying, ‘maybe we should move the service-line in 3 inches’ …meaning: shrink the service court… In Roval, hard/flat shots are difficult to stay in a court with no corners that cuts away. Players will learn TOP-SPIN, CONTROL and FINNESSE playing Roval. Big, open areas of the court and service court are gone. Roval players will have to approach the plex and learn to construct a point since banging away from the backcourt will prove ineffective. In essence, players of this new/curving/lineless game will learn to be better tennis players. A popular play will be a drop-shot to either the left or right of the soval to draw your opponent up to the plex. Then, the LOB over the opponent to that extra two feet of length will happen often. Tennis fans enjoy seeing this play and it can occur frequently during Roval points. Audiences also want to see RALLIES; sharp angle shots and beautiful ‘touch’ points. ROVAL FACTORS OUT POWER from the tennis game. There will be fewer clean winners. Points will depend on tennis skills of strategy and hitting angles…and not a reliance on pure power. Shot-making, placement and CONROL will win at Roval and not players with the large/power game. Soval service areas are smaller than classic service squares so SERVES MUST BE SPUN IN. Aces will hardly exist in Roval, which is a throwback to the original days of tennis not dominated by SERVE. A Roval court also provides an ideal TRAINING COURT because of its smaller size. Players will become used to hitting smaller targets. When going to a traditional tennis court after playing on a Roval court, the CLASSIC COURT WILL SEEM HUGE. ROVAL COULD POSSIBLY BE A COURT WHERE, BELIEVE IT OR NOT, A FEMALE PRO COULD CHALLENGE A MALE PRO! Power has been filtered out and big serves do not dominate the new racquet sport. Why couldn’t a woman take on a man playing Roval? Imagine constructing such a futuristic court and inviting ladies to play the men. I think you would have the World’s Attention; remember when Billie Jean King took on Bobby Riggs and the global sensation that occurred in its aftermath? Today, with media everywhere, such a staged event of Man vs. Woman would be phenomenal. Lineless, feminine, colorful Roval could become super popular if produced and promoted the right way. If you think a woman could never beat a man, consider Roval’s new scoring method: STREAMLINE SCORING A futuristic court should have a futuristic, new SCORING method. I just could not see playing ROVAL and using the old-fashioned, normal, 15-30-40-game. The classic scoring is another 19th Century tradition. The oval court HAD to have an accompanying Scoring System just as bizarre. It's not easy to create a unique and never-been-thought-of before Scoring System; have it work and even have some advantages over classic scoring. Let's break from tradition and try Streamline Scoring. Every point is worth one more than the previous point. Each game is worth one more game than the previous one. There are no deuces, ads or tie-breaks. THE FIRST POINT OF A GAME IS WORTH 1 POINT. THE SECOND POINT OF A GAME IS WORTH 2 POINTS. THE THIRD POINT OF A GAME IS WORTH 3 POINTS. THE FOURTH POINT OF A GAME IS WORTH 4 POINTS. Games are played to 7 points. Games may go to a deciding fifth point. The fifth point is not worth 5 points; it is simply game-point. THE FIRST GAME OF A SET IS WORTH 1 GAME. THE SECOND GAME OF A SET IS WORTH 2 GAMES. THE THIRD GAME OF A SET IS WORTH 3 GAMES. THE FOURTH GAME OF A SET IS WORTH 4 GAMES. THE FIFTH GAME OF A SET IS WORTH 5 GAMES. Sets are played to 11 games. Sets may go to a deciding sixth game. If a player wins the first 4 games, the set score is 10 - 0. If the one with zero wins the fifth game, the score is 10 - 5. Sets are played to 11 so the winner of the next game wins the set. This seems unfair: the one who won only 2 games could win the set, but the one who won 4 games could lose the set. In Streamline Scoring, it is important which points and games you win. The later ones have greater value. This concept builds excitement and the importance of the NEXT points and games ACCELERATES. In tennis, different points have different weight. A 30-30 point means more than 15-love. A tie-break point has much more value than a 30-30 point. It is the same for each player. Streamline Scoring has a methodology similar to double-or-nothing. There is little chance for blow-outs. No one wants to see a 6-0 set. Viewers want to see close matches. Streamline Scoring favors the player who is behind. They are always in the match and can come back. The one who is winning is always in a precarious position. It seems confusing. But with a little practice, we can adjust to it. Stadium signs and TV graphics should alleviate the confusion. (We can even play Streamline Scoring NOW, on regular courts. The server should begin serving on the AD side to remind you that the first point is worth 1 and therefore odd. The second point is worth 2, which is even and should be served on the deuce side). For anyone building my Roval court or any ‘court of the future’ you MUST have an I.O.B. or INSTANT OUT-BUZZER. When a shot is hit OUT, the BUZZER RINGS immediately! Here is the solution to ‘challenges’ in tennis. GET RID OF THEM…AND THE LINES PEOPLE! Surely computer wizards can put together an INSTANT buzzer system. Like in football and basketball…a whistle stops play. A simple, binary, computer program where the top IN shot is ‘0’ and there is no buzzer. As soon as there is an OUT ball (the computer knows this in a nano-second), it is ‘1’ and the BUZZER RINGS!! The computer or automatic fault-and-OUT detector will only work if the machine recognizes the second picture and can sound the alarm in less than a second. Any more time and the BUZZER sound might be confused with the next shot of the opponent. No one is working on the problem to see how quickly a machine can recognize an OUT and blast a sound. A ‘second’ is a very long time to a computer. We could eliminate the eternal problem of line calls/human errors in tennis…today. Players should not have the burden of ‘do I challenge; is it in or out; what does my box think; do I have any challenges left? Oh no…it’s too late to challenge.’ Tennis pros should not have to deal with these distractions and strictly focus on the game. All shots are played until we hear the buzzer…removing the question of IN or OUT. HAVE THE COMPUTER GEEKS RIG A BUZZER SYSTEM! The problems are easily fixable. Test it; try it. I am sure, in the 21st Century, it can be done. Imagine having old lines people with thick glasses a thing of the past. In the future, there will definitely be no more lines people calling the shots. ROVAL could test the I.O.B. and make it perfect. Why am I writing to Carlos Costa, agent of Rafa Nadal? I only wanted to make contact and show you my designs for a new tennis. I have not been a success and do not have any funds to promote the ideas expressed here. I just think the designs are COOL. I assure you my theory of the old court being too large does not apply to CLAY COURT tennis. It is HARD COURTS where people have complained that the game has become all POWER and all SERVE (and even ‘boring’). I have contacted many people within professional tennis about Roval and they have acted like I have a disease. I love tennis; I am no traitor to tennis because I want something BETTER and SMARTER; an innovation or improvement. I was on a college scholarship for tennis and have followed the game closely over the last 45 years. My heroes have been/are Borg, Agassi and now Rafa Nadal. Possibly, you could pass this on to Rafa; he might like it, no? Maybe he’d like to have a rounded court without lines at his home? RING-RONG also warps the field of play. The dimensions of the table are slightly stretched, yet much of the area is removed. More odd angle-shots off the edges will occur because there are more edges. RING-RONG is far easier to construct than a ROVAL court…and could be made to PROMOTE the larger racquet sport. To get players ‘to think’ in this new, curved shape is important. The warped field of play is interesting because it is an area PARALLEL to one’s ‘wheelhouse.’ In other words, rather than hitting a square or rectangular target…the newly designed target-area becomes a curved field harmonious to the arc of a backhand or forehand swing. The table version requires an oval wider than its thin, larger brother. Two CLEAR, Plexiglas boards as legs are under a hinged table on either side of the hole. RING-RONG balls ricochet when hit into the hole and remain nearby. Also, the table appears hovering! [ROVAL and RING-RONG are registered with the Writer’s Guild of LA]. Here is the solution to ‘challenges’ in tennis. GET RID OF THEM…AND THE LINES PEOPLE! Surely computer wizards can put together an IMMEDIATE buzzer system. Like in football and basketball…a whistle stops play. A simple, binary, computer program where the top IN shot is ‘0’ and there is no buzzer. As soon as there is an OUT ball (the computer knows this in a nano-second), it is ‘1’ and the BUZZER RINGS!! Why Have They Sabotaged Tennis? ESPN2 advertises that they are the new home for tennis! That fact is not something that any tennis fan should be proud of; it is a disgrace. It is an insult. The beautiful sport of tennis does not rate the high esteem of ESPN. No; and it will certainly not be found on regular television. Only main matches of Wimbledon and the U.S. Open rate prime viewing on TV. Tennis has been demoted down to ESPN2. Why not bury it completely and put it only on ESPN3 or 4? Here is my beef with ESPN2. They have a constantly running scroll of sports news at the bottom. We tune in to watch TENNIS! We want an unimpeded view. We sit for hours watching our tennis and we are forced to see the same info repeat a thousand times! And tennis fans are supposed to be pleased? They have sabotaged tennis so much that many of the Masters Series tournaments are not aired at all. Where is the Italian Open and German Open? Where is Monte Carlo and other European events? They are gone and no longer exist to American sports fans. Yet, ESPN will air POKER, women's college basketball and cheerleading championships. Why are they trying to destroy the wonderful game of tennis? How about HD? Imagine my excitement to finally own an HD large-screen TV only to NOT have tennis aired in HD. They air it on HD channels, but it is not HD. [Tennis is not the only thing un-HDed while on an HD channel. They will advertise in HD bringing back a show like Northern Exposure, but when you view it...it is not in HD. Yet, poker comes in crystal clear in high-definition. We do not want to miss every sweat droplet of the excitement there]. Maybe the reasons (in the minds of the programmers) are demographics and the lack of Americans at the top of tennis. I say it is their lame, at best, coverage of tennis that causes the low ratings. I blame ESPN. I blame American sportswriters. Placing tennis on the back pages is one way to kill tennis. Critics will say 'tennis is lonely, cold.' But, they do not say that about Golf (probably because of Tiger Woods). TENNIS DESERVES BETTER. When athletes from other sports are in the stands watching tennis live, they praise the athleticism of the players. Recently, Terrell Owens was amazed at the speed of the ball. Why is it that sports pundits do not have respect for tennis? ps. Please eliminate 'challenges' in tennis. The computer knows in 2 seconds if a ball is in or out. Serena Williams could have won a set, but she was out of challenges. Players feel bad when they are wrong. Players have enough to think about. Let the computer decide every point and take those decisions away from the players. Stephen Pellegrini's background is high school and college player ("2 years - studies took over my Junior year"). He graduated from BC in 1975. He then coached a Philadelphia NJTL team in 1973 that won the city championship (took them to the nationals in East Lansing, MI - they placed third). Played recreationally on and off since then. He also studied martial arts for the past 30 years. He has a 3rd degree black belt from Mr. Nackord in Kenpo. He is 50 years old, married with a son, 15 years old, who is also a black belt, and an advanced novice tennis player now. Stephen, his son, and his wife play tennis for fun and recreation. Melissa submitted a concept/argument paper that she wrote for English. "To see Good Tennis! What divine joy can fill our leisure, or our minds employ? Let other people play at other things; The King of Games is still the Game of Kings." The game of tennis came from royal beginnings, played all over by some of Europe?s finest aristocrats. Kings in the 16th and 17th centuries from France, all supported the game. But imagine the same game today? Because players of all sports are so competitive, it would be hard to imagine King George IV playing against someone such as John McEnroe. Even though the game was entirely different from today, it helped shape the very popular sport that so many players all over the world have come to love. There are many forms of tennis such as paddle tennis, table tennis, squash tennis, etc. The dictionary defines tennis as being a game in which two opposing players ( singles) or a pair of players (doubles) use tautly stringed rackets to hit a ball of specified size, weight, and bounce over a rectangular court. Points are awarded to a player or team whenever the opponent fails to correctly return the ball within the court. ( Encyclopedia Brittanica) Rules vary with different types of the game, but this is how court tennis is played today. Tennis originated in the 11th century, but there are many theories on how this game was started. One myth is that the game was played by monks in Italy and France. But it became so enjoyed that the Pope banned the game. Even though the game was banned, it became popular all over. Players were originally monks and school children and eventually became the sport played by kings. The players are a major part of the changes made throughout the history of tennis. J.K Stephen said, "What divine joy can fill our leisure,". This is a perfect quote for describing tennis about its early beginnings. Now, because players are so competitive, the spirit of the game has changed. People still play tennis to enjoy themselves, but professionals take it to another level. Andre Agassi said, "It?s not just about hitting a tennis ball, it's laying your heart on the line." Many people who play the game today, it really is not about hitting a ball, it?s putting your heart and soul into something. Not only have rules and players changed, but equipment as well. When tennis was first created, the game was played by bare hand. Soon, it was played with a glove, which later someone added cords too. Then, the Italian priest, Antonio da Scalo, in the fifteenth century invented the racket by adding strings and frame to a handle. Now, tennis is played with a racket, but a racket that is much larger and made of metal and not wood. The balls that were originally played with look similar in appearance, but are created much differently. The centers of the ball were made of cork and then covered in cloth. Next, the balls were bound tightly in string, covered in felt, and were hand stitched. The balls lasted for around two weeks. At first, the balls were about 1 once, before the invention of the tennis racquet, then became 3 ounces. The game, equipment, and players of tennis have dramatically changed since the 11th century, but for the better of tennis and the 21st century. The subject of the history of tennis is not controversial, but some people might feel that tennis is not a major sport, and is not important enough to examine and distinguish the differences from the past to present. Many people believe tennis rules and how the game is played and what it is played with is not much different from today. Lawn tennis and royal tennis (the original names) are in fact very similar to today?s tennis. But, there were so many different types of tennis all over the world. Not all of them can be the exact same, especially if most of the styles of tennis were invented before the 18th century. Also, there have been many versions of rule books written by monks, priests, and kings. Antonio da Scalo wrote a set of rules, along with Major Walter Clopton Wingfield in 1874. So, it would be impossible for the rules to have stayed the same. Athletes are becoming a large part of pop culture. Many tennis players are known by name all over the world, and are not only athletes, but celebrities. Andy Roddick , Andre Agassi, Serena Williams, Pete Sampras, etc. The list can go on and on. Imagine an aristocrat from England during the reign of Queen Victoria expecting a lovely lawn tennis match against a player such as Andy Roddick. Considering the fact that although anyone who played before the 19th century might have been a good player, Roddick holds the record for the fastest serve at 150 miles per hour. The game would most likely not last very long. But, because sports is such a huge part of pop culture all over the world, it is important that the athletes who play tennis have changed. It is important for tennis players because with the athletes today, tennis gets a lot of publicity with commercials and Grand Slams . So, with better players comes better courts, right? Originally, courts and equipment came in different sizes and shapes. Tennis players today would need new courts and equipment to go with the new rules. With the aggression and competitive nature that players experience, it would be impossible to play with equipment such as a glove with cords on it. There are still a variety of courts used today, mainly grass, hard, and clay, but many courts in France originally used walls for their games. Today, we only use the courts to play on, not walls. The original game and rules of tennis might have fit the personalities and entertainment people needed before the 19th century. It was not only for entertainment but relaxation. But if the same game was played today, it probably would not be very interesting. There is now a tennis channel and it is all over TV, but this would not be the story if the game were the same as it was when it was first created. Tennis would not be played as a sport in high schools or have their own grand slam tournaments. Now and days, the majority of players play tennis for excitement and competition. Tennis would not be where it is today had it not been for the boredom of Italian monks. The game changed dramatically for the better of the game and players. Tennis player today should appreciate the changes because it is the changes that have made it possible for tennis to become such a popular sport. All in all, the changes of the game of tennis are for the better of every aspect of the game. Steve Smith is a writer who lives near Chapel Hill, North Carolina. His Web site, Tops 4 Tennis, includes the expanded version of the above article at www.tops4tennis.com/articles/wimbledon.html. Wimbledon. It's a word that stands for tennis at its best. Although it is first of all the name of a London suburb, for millions of tennis fans around the world it is shorthand for sportsmanship, athletic prowess, and celebrity stardom. For the half-a-million or so people who manage to see at least some of the annual championship games in person, it also means a huge social event. One of the great things about the championship tennis tournament played every summer at Wimbledon is that it's one of the few major sporting events for which the average fan (i.e, neither rich nor well-connected) stands a decent chance of gaining entry. Interestingly, the Wimbledon games ultimately owe their existence not to tennis but to another, more sedate, game that was all the rage among the Victorians: croquet. You see, the private club that sponsors the world's foremost tennis championship was founded originally as The All England Croquet Club. Founded in 1868, the club did not hold its first tennis championships until 1877. Those games were witnessed by a few hundred spectators in what is described as a "garden party atmosphere." For a long time now the club's name has been The All England Lawn Tennis and Croquet Club, and the Wimbledon championships are attended by more than 500,000 people as well as carried to millions around the world through mass media and the Internet. The tournament starts six weeks before the first Monday in August and runs for approximately two weeks. Players from more than 60 countries regularly compete. If you're planning to be in London during the two June or July weeks when the tournament is being played, getting in to see at least a match or two would be a marvelous experience for any tennis fan. So how can you score a ticket to this greatest of all tennis events? If you definitely want to attend the next year's Wimbledon, you should enter the public ballot (or lottery) that is held each January for some of the Centre Court and No. 1 Court seats. You will need some luck to pick up a ticket this way, but it's worth a try. All it takes is obtaining the official application form and returning it by the deadline (the exact procedures and addresses are detailed on the Tops 4 Tennis Web site at www.tops4tennis.com/articles/wimbledon.html). If you are successful in the drawing for tickets, you will be notified about four months before the beginning of the tournament and asked to send payment at that time. Another way to get into the tournament is to purchase a travel package from one of the many companies specializing in tennis tours. Most of these Wimbledon packages will include transportation, lodging and perhaps some local side tours in addition to the tickets themselves. This is a convenient way to go to the tournament if you like the all-in-one approach to buying travel. If you're more of an independent traveler, it might not suit you as well. You can find Wimbledon travel operators on the Web by searching on "Wimbledon tournament travel" or "Wimbledon travel package." There are also a number of ticket brokers online, some of whom specialize in sporting events such as Wimbledon. They buy tickets from willing sellers and re-sell them to willing buyers, or alternatively they simply bring the sellers and buyers together to make their own deal. The brokers make their money through the fees or commissions they charge for this service. Finally, you can also stand in line for tickets during the tournament itself. Several thousand same-day tickets are put on public sale while the games are going on. You'll have to be present and willing to stand on line a long time to get one of these. In the end you might still miss out, but if you're in the area anyway and have patience, you should show up early and have a go at it. If you're an avid tennis player or fan or both, Wimbledon is one event you should see in person at least once in your life. Tilden was a great tennis observer as well as a player. He studied and wrote about all of the top players of his day, and observed and advised many a tennis beginner. We can trust him when he says that the greatest fault committed by novices (and by many more experienced players) is trying to watch too much besides the ball. The Service in Here is Terrible! Dear Reader (I assume the singular and hope for the plural) I have completely re-written this article in the light of comments from my coaching muse, Roger Mills. Roger feels that there were too many ‘negatives’ in the original. The principle here is ‘tell them what to do rather than what not to do.’ I apologise for the negative in that sentence; that will be the last one. Henceforth I will not be so negative. Damn. I mean, ‘henceforth I will be more positive’. I also apologise to Roger for the fact that the postman got him out of bed, demanding money with menaces, because the copy of the article I sent him was overweight for the stamp. I promise to weigh all my post in future. Question: What is the most important shot in doubles? (a) and (b) are definitely wrong, (c) depends on the circumstances. The most important shot in doubles is the serve . Having a good serve is a major advantage; which poses the question, what is good serving? In doubles, we want to be attacking, which means forcing the opponents to lift; so low serves are the order of the day. That is, serves skimming the net tape to land fairly close to the short service line. Playing the shuttle from below ‘net tape’ (as we usually say in referring to the top of the net) the receiver will be forced to lift or play the shuttle back close to the net tape. (Better players will be able to play a ‘push’ from just below the net tape, past the server - unless the server can intercept). The variation on low serves will be ‘flick’ serves, which should be hit over the receiver as s/he attacks the low serve. Flicking gives the attack away, but if the flick is deceptive (see below Flick Serves), the receiver should have to change direction quickly, making attack more difficult. Persistently high serving, with no attempt at disguise, is only likely to be effective against relative beginners or players who lack an effective smash. (Even then, it would be a bit predictable). The doubles long service line means the back tramlines are out for serve in doubles, so even the best doubles serves must be shorter than the deepest serves allowed in singles. It is more common to see high serves in lower level ladies matches, the perception being that men smash harder than ladies. (Before you start sending me hate mail, obviously some women hit the shuttle harder than some men; but at any given level, League, County, International, etc., the men will generally be more powerful). However, good low serves are more effective if the receiver stands further back to receive, as many ladies (and beginners) do. In top-level ladies doubles low and flick serves are much more common. Most people would settle for accurate and consistent low serves, close to the net tape; but there is more to it than that. Good serving involves knowing how and when to vary the placement of the serve - and when to persist with a serve that is effective. The most important thing is to force the receiver to try to return the serve. Many ‘cheap’ points are scored when receivers fail to return the serve into court. Equally, a lot of errors are made by the server trying to serve too close to the net tape or to the lines. You only need to do that if your opponents are returning aggressively and effectively. Only serves that you make the receiver play are going to earn you points. A good server will observe how and where the opponents stand to receive, and which racquet face (if any) is preferred. Some receivers will stand too close to the centre line or too close to the sideline, leaving a large space to serve into. Others will stand a long way back from the service line, which means they will have difficulty attacking the low serve, but will deal with flick serves and high serves more easily. Servers should develop the ability to serve anywhere along the short service line. If this can be done with deception, great, but even if your opponent has an idea where the low serve will go, it is better to serve to the place they would least like. Variation of serve is also a good idea - low serves to different places along the line, and some flicks. The time to leave out the variations is when you are struggling to get a good serve over. Then you should go back to your best serve - analogous to the bowler’s stock delivery. If you find a serve which continues to cause a problem for the opponents, don’t change it unless it ceases to be effective. Many players hit very flat flick serves or 'drive' serves, which the receiver can intercept without much backward movement, and which, if left, often go out at the back. Another common error is to try to flick too close to the centre line or the sidelines - far too many of these will go out too. The flick should rely on deception, going over the incoming receiver, rather than on pace or placement too close to the lines. The moral is, if you flick, flick OVER (the opponent), flick IN (the court). If you have a good flick serve, use it at the first opportunity, to put doubt in your opponents' minds as early as possible. There is, of course, very little point trying to deceive someone who stands a long way behind the front service line with a flick. However, a higher flick serve will still force them back (as far as the rules of doubles allow), where they may be very weak. Warning: Although every effort has been made to make this a negative free article, with zero amounts of ‘can’t, won’t, shouldn’t, hasn’t, and isn’t’, the article may contain traces of ‘not’, to which some particularly picky and pedantic readers may have a reaction, especially if they have got our of bed the wrong side having been woken up by the postman. This site, All About Tennis.com, is in the top 1% of all websites according to Alexa. If you are a webmaster or planning to have your own website that consistently pulls in visitors, then I highly recommend Ken Evoy's Solo Build It! (SBI!) is the only all-in-one site-building, site-hosting, and site-marketing product that makes it easy for you to build a professional, popular, and profitable business. 62% of SBI! sites fall within the top 3% most popular sites on the Internet. 53% fall within the 2% most popular.